This is Part 3 in a series on the 2008 HUGe swap. It took me a while to figure out what I wanted to do for Bangle #7. I had an idea in my mind about doing a lacy type pattern that would allow the color of the bangle to show through. I started by trying out the Miniature Leaf pattern from BW1, held it over a few different colored bangles and did really like what I saw. I tried the lacy pattern on a silver/mirror finish bangle and a red colored one. Neither lookde quite right to me. Version 2 was this zig zaggy pattern which you can see is too subtle for this project. 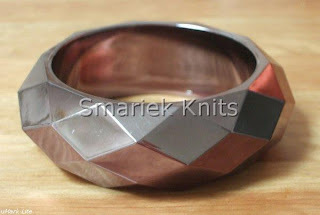 You could barely see the zig zags and it is even less noticeable when considering that only a thin sliver of the middle section would exposed on the bangle. I was afraid people might look at it and think the pattern was just totally random or just botched up. In the end I decided to try the Double Texture Cable from BW3 pg 70. I thought it was interesting because half the cable is plain stockinette and the other half is seed stitch. 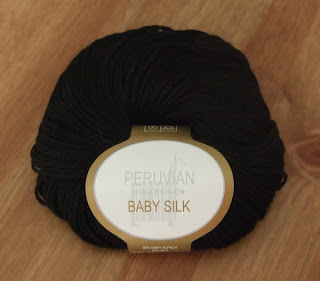 Unfortunately the pattern loses some impact on this black yarn. You can see what the swatch looked like in the photo above. The yarn I used for this is a fingerling (sock) weight yarn, Elann Baby Silk. I've had this yarn since August 2005, and it took me 3 years before I finally dug it out to do somethnig with it. This one was a challenge to knit because the dark yarn made it difficult to see, and I was knitting it using 2.75 mm (US2) needles. 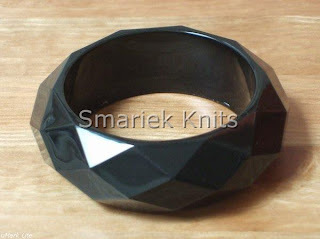 I used a black colored bangle for this one. 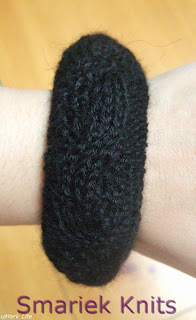 The upside of using a black bangle is that with black yarn, I didn't have to worry about the bangle showing through in a bad way. :-) Seaming this took quite a bit longer than any of previous bangles due to the difficulty of seeing black yarn. Repeat Rows 1 to 20 for pattern. As basic as this cable came out, it actually took me 5 tries before I decided on how wide the cable should be and how many rows to cable on. 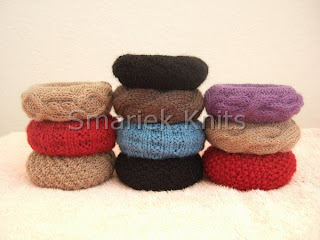 I had an idea of using the Eccentric Cable from BW1 and started with a 3-over-3 cable every 6th and 12th rows. Then tried 4-over-4 cable ever 6th and 12th rows. The cable didn't seem wide enough, so third try was 6-over-6 cable every 8th and 16th rows. Then I changed the interval by doing a 6-over-6 cable every 12th and 24th rows. I didn't like the Eccentric Cable style, so changed this back to cabling every 12th row. I knit this one with sock/fingerling weight yarn, Elann Sock It To Me in the latte color using 2.75 mm (US2) needles. 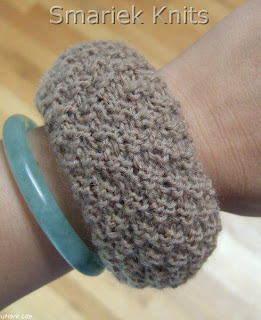 The yarn is the same one I used for Bangle #6. 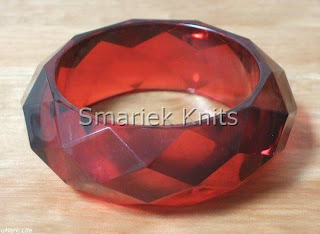 And I used a transparent red bangle like the one above. Repeat rows 1 to 24 for pattern. CF12 = Slip 6 stitches onto cable needle and hold in front. Knit 6 stitches. Knit 6 stitches from cable needle. Here's Bangle #9. At this point I finally felt like I could finish the project before the deadline. I needed to make 10 items, so making one more should be a cinch. I was really worried about making the deadline to mail the bangles to Theresa, because I was making these bangles at a rate of 2 per month. 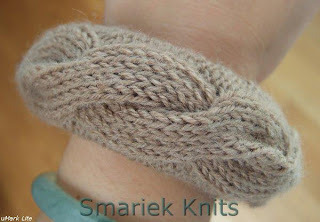 This was knit in the same yarn as Bangle #8, Elann Sock It To Me in Latte color with 2.75 mm (US2) needles. I decided to take a break from cables and do a simple Double Seed Stitch pattern. I used a charcoal colored bangle for this one. Repeat Rows 1 to 4 for pattern. 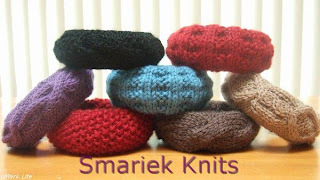 I still had plenty of the Elann Sock It To Me Yarn to make another bangle with it, however it was definitely time to use a different yarn and/or color. Looking at the 9 bangles made so far, there is a heavy slant towards the browns/tans. I think it is a good neutral color for most people, but really, it can be too much of a good thing!!! So with 4 brown/tans, 2 reds, 1 purple, 1 blue, and 1 black ... what color should be next? Purple is one of my favorite colors, although I don't think there are as many people out there would would like a purple bangle. So I nixed purple for bangle #10. I went back to the black Elann Baby Silk, using a simple Moss Stitch pattern. 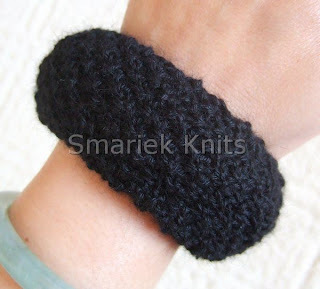 Like the other one I made with black Baby Silk yarn (Bangle #7), I also used a black bangle for this one too. I was so happy to finally finish my 10th bangle, and before the due date too! It looks like you had alot of fun tinkering with these until they were just right. 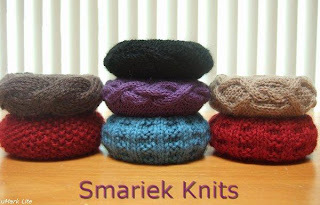 These are FUN projects that won't take forever to knit. I always enjoy your posts and love seeing what you are up to. I nominated you for Kreativ Blogger award!